Outside at the Pavilion - open to the public - rain, snow or shine! 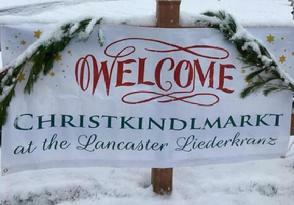 Celebrate the season at our German-style Christmas market! There's something for everyone at this holiday event! Towns and cities throughout Germany and Austria mark the start of Advent with the opening of the public Christmas Markets. Although originally meant to bring craftsmen and artisans together to sell their wares to townspeople, modern versions are more festive destinations featuring a wide variety of products and, most importantly, the wonderful seasonal food and drink to be consumed by shoppers while browsing through stalls of handmade gifts and decorations. As in traditional German Markets, our Christkindlemarkt will feature vendors selling their wares, food & drink and cultural entertainment. Service dogs only. Food and beverage may not be brought onto fest grounds. Cash Only event--Sommerfest & Oktoberfest F&B tickets are not used at this event. ATM available at the Clubhouse. FREE shuttle parking lot at the former Forever 21 Distribution Center located at 1156 Four Star Dr, Mount Joy, PA 17552, with continuous bus shuttles to and from Christkindlmarkt. Approx 1.2 miles from Clubhouse. Click our SignUp Genius link and lend a hand!